What’s the point of putting my voice out there? Wouldn’t my blog post just be a drop in the bucket of more experienced writers and more qualified authors who have written entire books on the topics I’m speaking about? 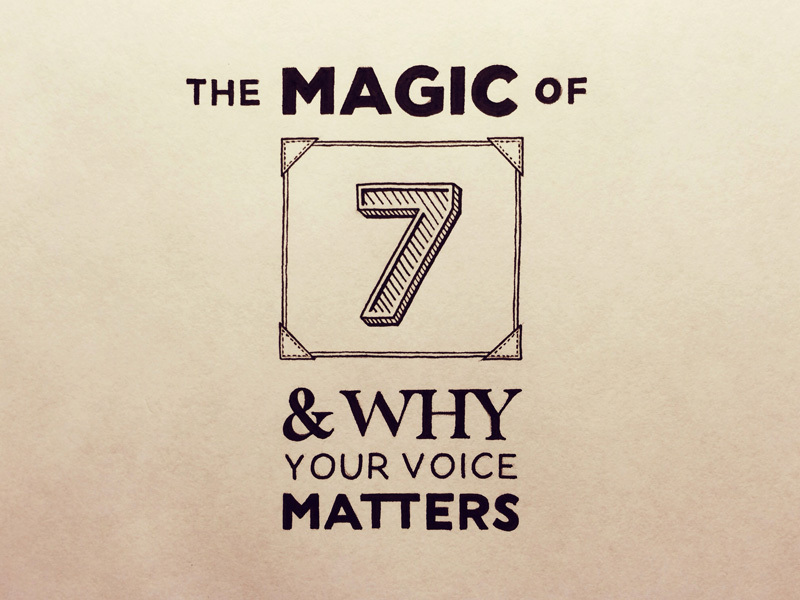 I share why YOUR VOICE matters, why the internet is skewing your perception, and why competitors are not the enemy. You’ll learn how to repurpose an existing message in such a way that it will resonate with a new audience. Get ready to find and embrace your own unique style. Don't write because you have something to say, write to find what you have to say. You’ll be surprised at how much you learn from writing. 02:11 It takes hearing new information 7 times before it is retained. 02:46 It’s easy to regurgitate things you’ve heard, but it doesn’t always mean you’ve internalized them. 03:56 Speaking actually counts towards one of the times you need to hear something. So even if you haven’t fully grasped a concept yet, regurgitation can be beneficial in that it counts towards the 7 times needed to hear that concept for it to resonate. 05:00 I read a book called Confessions of a Public Speaker by Scott Berkun, and something I read in the book helped me out this past weekend. I ended up meeting someone I might not have met otherwise because of something I read in that book. Now, Scott certainly wasn’t the first to share that kind of information, but because it resonated with me at the time that I read it, I attribute the value of the advice to Scott. He didn’t have to be the first person to share that advice, he just had to share it and it ended up resonating with me at the right time. 10:33 So many people say “Why should I blog?” “Why should I put my voice out there?” “Why should I start a podcast?” “So many other people have already said the same things.” But you could be someone’s 7th time. 13:02 The internet makes the world feel like a much, much smaller space. You get in a niche and you forget you’re inside this bubble. In this little world, it feels like everything is already so saturated. But it’s not. It’s the internet bringing everything together into such a condensed form. You’re only seeing the cream of the crop—the forerunners. But that’s just a small selection of a few people spread out across the world! 13:45 I’ve carved out my podcast audience from a completely different market. 17:27 We often see the people that are doing the same things as us as competitors or “the enemy.” But what if we instead viewed competitors as helping your audience be exposed to something numerous times and potentially setting you up for being that 7th exposure. It’s very hard for you to expose your audience to an idea 7 times, and by being ok with the fact that your “competition” may be making up those other 6 times, you’re able to be the one that resonates with them. When you convey something to them for that 7th time they will attribute the value they receive to you. Your competitors are priming people to potentially respond to you as the 7th person who communicates something to them. 21:33 Maybe someone you know has a really great message that you agree with and are on board with, but they curse in all of their talks. Take a piece of their packaged whole and repurpose it in your own voice. What you offer will resonate to a different audience—or to the same audience in a different way. 23:16 Other people may have a certain level of success, but we often underestimate the greater reach that message could have with one little thing tweaked, or one nuance that’s different from that person. 26:35 Why shouldn’t you go back and delete your old work. 29:04 We simply regurgitate what we’ve been exposed to. But because each of us have a unique combination of exposure, what we regurgitate is still new to other people and it has our personal voice. 29:26 There’s nothing new under the sun, but there are plenty of different angles you can approach things. You are a unique collection of all the things you’ve experienced. The more you put stuff out there, the more you’re going to come into your own unique voice and your own unique style. Don’t worry about whether something’s been said or done, because it’s all been said, and it’s all been done. There’s someone born every day who hasn’t seen the Flintstones. 33:13 Who are we to say something’s not worth saying again? We have no idea where our audience is. It could be the first time someone’s hearing what we’re sharing or it could be the 3rd or 7th time. We shouldn’t be afraid to say things again. 34:45 You can’t just say the same thing 7 times in a row, you have to account for the time aspect. 35:49 Don’t write because you have something to say, write to find what you have to say. You’ll be surprised at how much you learn from writing. 40:37 Be willing to iterate in public. Make mistakes in front of people. It humanizes you and shows that you’re a real person. If you’re smart, you’ll recognize it as an opportunity to teach and provide value.